NEW YORK, NY--(Marketwire - September 27, 2010) - U.S. Banker and American Banker today unveiled the annual The 25 Most Powerful Women in Banking and Finance™ rankings. This year, the women featured in the eighth annual rankings reflected on the role mentors can play in helping to accelerate a woman's career. The rankings, available in their entirety at US-Banker.com and in the October issue of U.S. Banker, recognize the professional achievements, personal tenacity, and influence of top-performing female financial executives. "While top performance in the financial services industry is critical to the success of this year's honorees, often it's been help from a mentor or a sponsor that has catapulted these women from top performers to superstars," said Alan Kline, editor in chief of U.S. Banker magazine. "This year's honorees all have a story to tell of the professional advice and counseling they've received from formal and informal mentors. And, they are committed to giving back to the next generation of female leaders." Carrie Tolstedt, Wells Fargo & Co.'s Senior EVP of Community Banking, tops this year's The 25 Most Powerful Women in Banking for the first time. Tolstedt oversees the community banking division, which is a major revenue driver for Wells Fargo. She has also distinguished herself from her peers by playing a key role in the integration of Wachovia with Wells Fargo. Tolstedt oversees one of the U.S.'s most extensive banking franchises including more than 6,300 branch locations, more than 12,000 ATMs, and a leading online banking channel, and leads more than 119,000 employees in 39 states, plus the District of Columbia. "It's an honor to be recognized among this remarkable group of women," said Carrie Tolstedt, Wells Fargo's Senior EVP of Community Banking. "Each of us has an opportunity to help build the next generation of leaders who will take our industry forward serving our customers, companies and communities." Following Tolstedt on the list is Deanna Oppenheimer, CEO of U.K. Retail Banking, and Vice Chairman, Global Retail Banking. Five years ago, Oppenheimer was sent to London to turn around Barclays' lackluster retail division and has since revitalized the entire business from its financial statement to its lobby. In January, Barclays rolled out a state-of-the-art flagship branch at its Piccadilly Circus location which recently took first place in an international design contest. Next on the list at third is ranking regular Karen Peetz, Senior EVP and CEO for Financial Markets and Treasury Services at BNY Mellon. Peetz, well-known within the community for her advocacy for female leadership in financial services, leads the Women's Initiatives Network, the bank's affinity group for female executives. The group has grown to include 40 global chapters with a membership of more than 2,000 women -- and even some men. Last week, Peetz was promoted to Vice Chairman and will take on additional responsibility overseeing the Pershing subsidiary, a consultant that works with brokers and related businesses. The rankings are determined by the financial performance of each organization or woman-led division, combined with a nominee's job responsibility, management style, crisis management skills, influence within the industry, and charitable endeavors. All of these are taken into consideration and debated by a selection committee that consists of the senior-most editors in SourceMedia's Banking Group which includes American Banker, U.S. Banker and Bank Technology News. The October U.S. Banker issue also profiles The 25 Women to Watch, the 25 Most Powerful Women in Finance, the Top Banking Teams, and Lifetime Achievement honorees. The 25 Women to Watch include: Irene Dorner, President and CEO of HSBC USA, Inc.; Heidi Miller, President of International at JPMorgan Chase; Diane Reyes, Citi's Global Head of Payments, Global Transaction Services; JoAnn Bourne, Senior EVP, Corporate Deposits and Global Treasury Management at Union Bank; and Mary McDowell, President and CEO at CitiFinancial, N.A. For the fourth year, U.S. Banker and American Banker recognized The 25 Most Powerful Women in Finance, top performers in the securities, asset management, insurance, private equity and exchange businesses. Topping this year's ranking is Dominique Senequier, CEO at AXA Private Equity. Following her on the list are: Candace Browning, Head of Bank of America Merrill Lynch Global Research; Barbara Byrne, Vice Chairman of Investment Banking at Barclays Capital; Liz Ann Sonders, Senior VP and Chief Investment Strategist at Charles Schwab; and Carla Brooks, Managing Director and Partner at Commerce Street Capital. Top Banking Team honorees: Harris Bank, HSBC NA, MetLife Bank, US Bancorp, and Wells Fargo, were chosen in part for their high percentage of female executives. 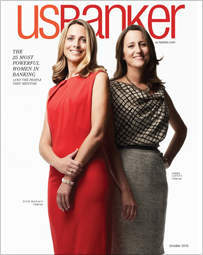 To determine the top banking teams, the magazine considered overall year-to-date financial performance of the company; the percentage of women corporate officers; the total percentage of senior women executives firm wide; the overall financial performance of women-led business units and functional areas; and growth-engine businesses led by women. In conjunction with the published rankings, U.S. Banker and American Banker will host an awards dinner on October 6, 2010 at The Pierre Hotel in New York City. Yasmin Bates-Brown of Harris Bank will be honored with the Marjorie Magner Lifetime Achievement Award, which recognizes a female executive's commitment to support education, equal opportunity and diversity. Diane Thormodsgard of U.S. Bancorp will also receive a Lifetime Achievement Award. Both lifetime honorees will be introduced by their respective CEOs -- Thormodsgard by U.S. Bancorp CEO Richard Davis and Bates-Brown by Harris Bank CEO Ellen Costello. American Banker (www.AmericanBanker.com) is the banking industry's daily source of information, news and analysis covering national and global issues, mortgages, consumer finance, legislation, investment products, card and payment systems and technology. U.S. Banker (www.US-Banker.com) is written for executives who must generate greater profits and shareholder value for their financial institutions and covers market trends, regulations, innovations and individuals that reshape the financial services landscape.